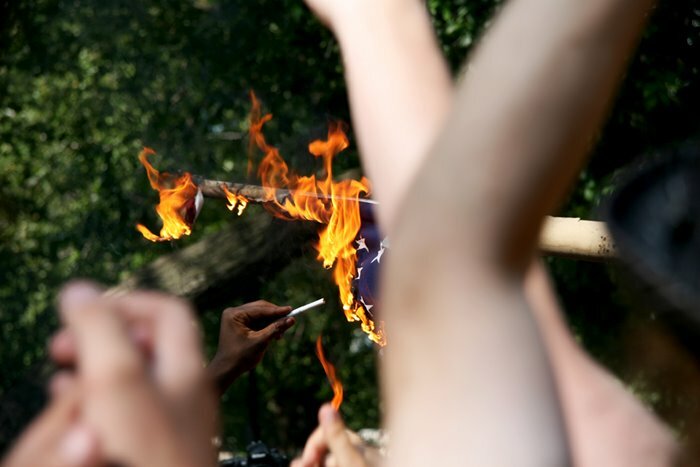 It's been awhile since I have seen a flag burning - this one appeared to be a spontaneous act which occurred at the 2008 Police Riot concert, featured yesterday on this website. I grew up in a time of protest, revolutionary sentiments and live in an extremely liberal environment. But I have always felt very uneasy at a flag burning. I always thought it was illegal. And it seems like an ultimate act of desecration - like smearing images of the Virgin Mary with excrement or spitting in someone's face. Flag burning is still not a criminal offense in the USA, however it is in some other countries. It has withstood two Supreme Court decisions (defended by William Kunstler, NYC Greenwich Village resident) as an act of protected speech under the First Amendment. Several flag burning amendments have been proposed which were very narrowly defeated in Congress, one by only a single vote.